As announced previously Enersize Oy (”Enersize”), of which Cleantech Invest Oyj (”Cleantech Invest”) holds 42.7%, has been investigating a listing of Enersize on Nasdaq Stockholm First North. Sedermera Fondkommission has now been selected to handle this process. The timing of the listing is estimated to be during 2017. The listing process starts directly and exact information will follow in an investor memorandum to be published later. Enersize recently added one large Chinese glass manufacturer to its project list after previously announcing orders in both the Chinese vehicle and electronics sector. “With an attractive case we had a large selection of advisors to choose from. We are very happy to announce that we choose Sedermera. We had our initial discussions with them over a year ago and we have been impressed with their thoroughness, professionality and integrity all along the way. 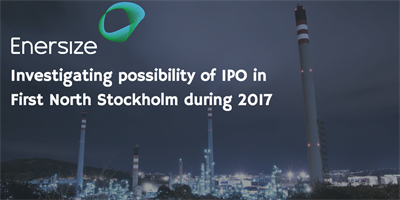 Enersize team is really looking forward working together with Sedermera for the 2017 IPO". “The timing to start our IPO process could not have been better. During the last year, we have more than tripled the size of our sales pipeline and closed several significant customers. The upcoming IPO gives us the possibility to take on even more projects". Sedermera Fondkommission offers services for listed companies or companies with the target of being listed at a trading platform. Sedermera’s services includes corporate finance, certified adviser, M&A’s, financial communications, issue management and market making. Sedermera is a secondary name of ATS Finans AB, an investment firm under the supervision of the Swedish FSA (Finansinspektionen). Sedermera’s headquarter is in Malmö, Sweden. The company also have offices in Lund (Medicon Village) and Norrköping (Norrköping Science Park). The organisation consists of approximately fifteen co-workers. Sedermera’s ambition is to create long term client and investing relations.